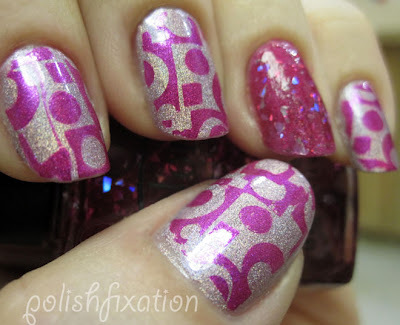 polish fixation: Stamping for Pink Wednesday! I actually have a pink themed mani to show you guys today! I can't remember the last time I was actually prepared for pink Wednesday! This mani has the base color I featured in yesterday's blog, Prevail's Concrete Jungle! And here it is with stamping! The stamping polish that I used was KleanColor's Metallic Pink. 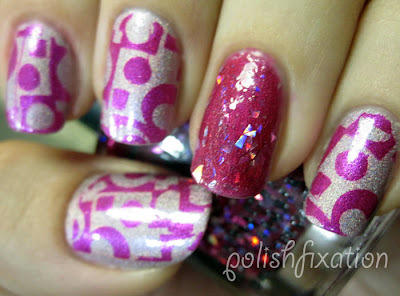 Let me tell you, KleanColor Metallics make amazing stamping polishes! If you stamp a lot and don't have these, please go buy them! You won't be disappointed at all! The stamp is on the Konad m65 plate and I love it! 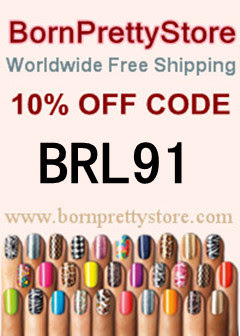 The accent finger is from Color Club's new Backstage Pass collection! It's the color called Fame & Fortune. As I write this, I have yet to take this polish off but I can only assume it is going to be one of those PITA to remove polishes...but I love it so much so I don't think I will care! 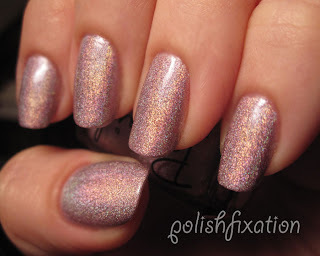 It's a jelly with flakie type holo glitter pieces. It wears like iron and is just so pretty to look at! So there you have it...Pink on pink Wednesday! AND DON'T FORGET TO ENTER MY HALLOWEEN GIVE-AWAY! I used this stamp with two different blues! Such a cool design!